By Kees Kaldenbach. More info about the author. Little has heen published (particularly in English) on the type of print known as the perspective view, intended for use in an optical diagonal machine. Nevertheless these prints were highly popular in the eighteenth and nineteenth centuries, and still appear regularly on the art market. lt therefore seems worth collecting what information is known and adding what I have heen able to discover. 1 This article opens with a discussion of the various types of optical diagonal machine and how they function. This is followed by a brief sketch, based on material taken from eighteenth- and nineteenth century catalogues and household inventories, of the social classes who owned thern. The final section is devoted to an examination of the different characteristics of the perspective views produced in the four main centres, London, Paris, Augsburg and Bassano: particular attedtion is paid here to two draughtsmen who worked for publishers in Augsburg. The optical diagonal machine is a viewing apparatus whose main components are a large, double convex lens and a mirror fixed directly behind it at an angle. These are attached either on top of a pyramid shaped box or on top of a stand. When the spectator looks at perspective views through the lens of the viewing machine, an illusion of recession is produced. In principe, a similar illusion of distance can he achieved simply by using a single, detached convex lens which is larger than the distance between two human eyes (at least ten centimetres). When this lens is held just in front of the eyes, the spectator is looking at the perspective view through its two edges which function like two prisms. Light rays bouncing off the print are refracted in such a way that they enter the eyes in a parallel direction. The brain interprets the incoming parallel images as a single image seen from a great distance. The important function of the lens in the optical machine is not its magnification but its creation of an illusion of depth in binocular vision. So that the greatest illusion of recession can be achieved, the perspective view should be designed according to strict principles of linear perspective, with a distant object placed in the centre of the print. For example, a view looking down a receding street works well because all horizontal lines in the buildings appear as lines converging at the same vanishing point. The interior of a large building, such as a cathedral, is also suitable for creating a successful illusion of depth (fig. 37). The least effective point of view is perpendicular to a facade, such as a row of houses, or to the front of a palace, because from that viewpoint there is no effect of perspective. In any case, the angle of vision for any perspective view should be wider than the angle of forty-six degrees which corresponds to the human eye's normal range of vision. This explains why perspective views have an appearance similar to a photograph taken with a wide-angle lens. Of course perspective views are not the only images which can be used with the optical machine: any two-dimensional image, such as a painting or a mural, would be suitable. However, the illusion of recession the latter would give to the spectator, would depend on the emphasis on linear perspective their images had. 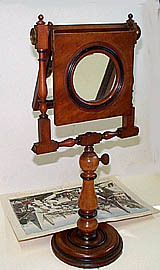 The most basic and, at the same time, effective model of a viewing machine is the table model on a stand whose lens is at eye level when the viewer is seated. In figure 36 the woman, Louise-Sebastienne Gély (later to marry Danton) is showing a perspective view to a boy (probably Antoine Danton's eldest son). So as to avoid any distortion which might be caused through the print curling if it were held manually, this model of the optical machine incorporates a mirror, fitted at an angle directly behind the lens which thus permits the prints to be viewed lying on a flat surface. The function of the mirror is simply to get round the problem of curling; it plays no part in creating the illusion of depth. Nevertheless it has the consequence that the image is seen upside down and reversed. For this reason, many views have the text not only at the bottom of the print in the normal direction, but also at the top, in reverse (and often in large capitals) so that it can be read when viewed through the optical machine. Some views, but not all, were also executed in mirror image so that they would be seen in the right direction through the viewing apparatus (see fig- 38, for example). This of course is simple for the engraver who does not have to worry about problems of reversal when engraving the plate. lt is difficult to give them a precise definition because of their many variations, but there are a number of common characteristics. Firstly, they are usually etched and invariably designed to be seen through a viewing machine, with consequent reversals of text and image. The size of the image is about 23 by 40 centimetres and the entire plate, with text, about 30 by 45 centimetres: sizes vary by 5 to 10 centimetres at the most. Perspective views are always horizontal in format, since the subject-matter is usually topographical. They often show monumental buildings (palaces, churches or town halls) or characteristic parts of towns (gates, squares, streets or harbours for example). More rarely they show portraits, depict moralistic or biblical themes, or historical events such as the demolition of the Bastille or the ascent of hot-air balloons, to name two of the more popular. "one should cover the flat mirror so much until one sees through the lens neither the edge of the painting [print] nor anything outside the edge, but only the painting almost entirely ... In opticas in which one cannot cover the mirror one can help by blackening the edges of the image." 'Esteemed not only for Furniture, but are likewise much used, properly coloured, without Frames, for Viewing in the Diagonal Mirrours, or Optical Pillar Machines, in which Method of looking at them, they appear with surprizing Beauty, and magnify almost to the size of the real Building; any of them may be had separate. Price is. plain, or 2s. each coloured'. Similarly, Robert Laurie's 1824 catalogue lists: 'Perspective views, coloured for the Show Glass or Diagonal Mirror . . .' It was probably the scientifie instrument-maker George Adams who coined the term 'Zograscope' to replace all these cumbrous expressions, but the name did not catch on. On the continent, names for the viewing machines and perspective prints were less diverse. In France, where the viewing machine was believed to have originated, the prints were called 'vue d'optique' or 'vue perspective', and the apparatus itself simply 'optique' or 'boîte d'optique'. In Germany, the views were known as 'Guckkastenbild' or 'Guckkastenblatt' (literally'looking-box-sheet'), while the optical machine was called 'Guckkasten'. Meanwhile in ltaly 'Realetti Prospettive' were viewed in 'Camere Ottiche', whilst in Holland an 'opticaprent' was looked at in an 'optica'. The second viewing machine in the Rijkmuseum, donated in 1980 by Lady C.J. Six (together with a collection of perspective views) is a wooden, four- sided, pyramid-shaped model, about 70 centimetres high (see fig. 39). lt has three closed sides and one open side, the latter bearing a row of candle holders which permit the prints to be viewed by candlelight as well as daylight. This model can be ingeniously folded up into the book shaped box which constitutes its base. On the spine the book title reads PERSPECTIVE VIEWS, in English. In 1753, the Englishman S. Parrat described a box-shaped viewing apparatus with a lens but no mirror (see fig. 42).10 In order to stand upright in this machine, a perspective view had first to be glued onto stiff card: the Rijksmuseum has a number of these prints. Meanwhile, the concave mirror is described in carly eighteenth-century books as an instrument used to create an illusion of depth when looking at images. For example, Ozanam (Récréations mathématiques et physiques, Paris 1735) describes the way a concave mirror works when placed in a'cham- bre optique'. The spectator looked through a hole in a box and saw in the concave mirror on the opposite wall the reflection of a view placed below the viewing hole. One can oneself put this to the test by using an ordinary shaving mirror, which is concave and thus magnifies. If one holds an architectural view at chest height and then stands with the mirror at arm's length in front of one, the resultant image has a noticeable illusion of depth, even if the mirror has a relatively small diameter. Another early description and illustration of a viewing apparatus appears in the famous Encyclopédie of 1767 by Diderot and d'Alembert. 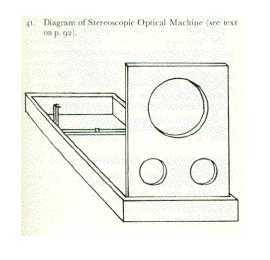 Figure 43, taken from the Encyclopédie, shows the simple model of the viewing machine on a pillar with a lens and a diagonally-placed mirror. Since there are no side walls on this model, the amount of light entering the machine is unlimited. Three years later Guyot, in a sequel to Ozanam's book, 11 also published a description of the viewing machine, together with an illustration. He wrote: 'the looking-box with a diagonal mirror. This type of looking box is very well known because they are in many hands'. Little has been written about the question as to what type of household owned the viewing machine. The most useful source of information is the study by Marie van Dijk on Dutch household inventories during the first half of the nineteenth eentury. 12 Altogether, Van Dijk researched 3,507 inventories (probates and personal estates) in 105 municipalities in Holland, and analysed them in terms of the ownership of toys and games. She differentiated five social groups: a) farmers, b) labourers and workers paid by the day, c) those without a trade, d) tradesmen and shop- keepers, e) notables and the well-to-do. Only the latter two groups were found to own optical machines, in five cases for tradesmen and shopkeepers, and in fourteen for notables and the well-to-do. The numbers of items recorded were as follows: viewing machines (12), magic lanterns (5), concave mirrors (5), cone mirrors (2), peep-shows (2), a cylindrical mirror (1) and an illuminating optica (1), all of these apparatus being listed with accompanying views either in the form of prints or views painted on glass. One individual, an 'entrepreneur', owned several of these optical instruments. The conclusion from van Dijk's study, then, was that these optical apparatus were owned only by the well-to-do. In order to meet the demands of the tax authorities, these inventories supplied estimated values. The Dutch guilder (Hfl or Dfl.) was worth roughly is 8d at that time. Van Dijk found that the value of viewing machines ranged considerably, from Dfl. 3 or Dfl. 5 to as much as Dfl. 8 (in an example where the apparatus included 100 views of the highest quality) or even Dfl. 10 (citing two cases, one in which the apparatus was estimated together with 60 views of the highest quality, and the other referring to the viewing machine alone). A magic lantern was estimated at Dfl. 7, while a cylindrical mirror was esti- mated, together with a cone mirror, at Dfl. 12. Finally, a peep-show was estimated at Dfl. 6, a price which included its views, lamps and base. Prices in London for perspective views and viewing machines can be found out more easily. For example, most auction catalogues give the price for a perspective view; 1s. for an uncoloured print and 2s. for coloured. Only the larger and more elaborate views of Roman antiquities (see fig. 44) were considerably more expensive, costing 10s. 6d uncoloured and £ 1. 5s. coloured. A viewing machine, meanwhile, could be bought in some publisher's shops, as is apparent from the Laurie and Whittle catalogue for 1795: Diagonal Mirrors, for the shewing of these views, neatly fitted up in Mahogany, with Looking- Glass. One Guinea each'. lt was also sold by scientific instrument-makers such as George Adams for prices varying in the year 1769 from 18 shillings to £ 2. 12. 6d., although in subsequent years (for example 1789 and 1797) the prices listed in his catalogues are more constant. However, prices in Paris were much lower. An indication of wholesale prices in Paris has recently been estimated by Pierre Casselle investigating the probate inventory of the print publisher Laurent Pierre La Chaussée, which was drawn up by his colleague Louis Mondhare in May 1782. 14 Casselle gives the following prices: 328 livres tournois for a group of 138 plates (which is 6 livres, or 5 shillings each) ; 112 livres tournois for a stack of 2,800 perspective views in black and white, of 'demi'-fine' quality (which is less than a sou, or about one penny each); and 6 livres tournois for 14 viewing machines, an estimate which should probably he understood as 6 livres for them all. The publisher Remondini from Bassano lists in his 1772 catalogue four perspective views for 1 lira (or five pennies) if uncoloured and for 2 lire when coloured. By 1784, however, his prices were about 20%. lower, with a wholsesale price of 20 lire for 100 uncoloured views, or 35 lire for 100 if coloured. Later still, in 1817, these prices dropped even further, to 12,50 and 20,50 lire respectively.15 Remondini's prices are thus clearly lower than those in London and Augsburg, but still higher than the average price for a perspective view in Holland, which cost about two pennies each according to the rate of exchange already cited.16 The latter information is derived from a collection of late eighteenth-century Dutch sale catalogues of books and curiosities. 17 Some thirty of these have had the prices of the books and curiosities jotted down in the margin, evidently by the customer or the auc- tioneer. These prices are as follows: from Dfl. 1 to Dfl. 10 for a viewing machine, from Dfl. 4 to Dfl. 36 for an illuminating optica, Dfl. 5 for anamorphoses, from Dfl. 7 to Dfl. 32 for magic lanterns (with the exception of one which was priced at Dfl. 112) and finally Dfl. 0,10 (or 2 pennies) for perspective views (sold in bundles of 10 or 20) and a little more, Dfl. 0,12 for illuminating views (also sold in bundles of 10 or 20). The evidence indicaties, then, that only the well-to-do could afford perspective views and the viewing machine. 18 On an average wage of no more than one to two shillings a day, the German, British or Dutch labourer would have hardly been likely to afford such luxuries. However, the less well-off were able to become acquainted with perspective views at fairs and markets, where travelling showmen displayed their views, often with an accompanying story, for a small fee. As late as 1932 the German author Elsner von Gronow could state that 'the optica is only known to our contemporaries from the annual fair'. Perspective views produced in London are generally of high quality. Publishers were apparently prepared to invest in competent draughtsmen, engravers, printers and colourers. They can also be distinguished from these made in the other centres by their colouring; thus skies are sometimes coloured in atmospheric perspective with dark blue at the top shading towards a lighter blue on the horizon. In general, prints produced in Londen are easy to identify in that, in accordance with the copyright act of 1734, they carry on them the name of the publisher and the date of publication. This, however, may not invariably have heen done, and many impressions have been trimmed as part of the mounting operation. There are therefore cases where certainty is not easily reached. (a) Henry Overton I, at the White Horse without Newgate, 1717. This contains 24 pages listing, in a rather disorganized way, maps, 'prospects' and 'views', which may be understood as perspective views. Of these I counted a total of 164. (b) John Bowles at Mercer's Hall, Cheapside, 1731 - Of the 63 pages, these on pages 28-30 list 56 perspective views, under the title 'prospects'. (c) Robert Sayer of the Golden Buck opposite Fetter Lane, Fleet Street, offered 202 views in 1753 (although the title-page boasts 206); a further 14 can be found in his 1755 supplementary sheet. Sayer's stock was taken over by Laurie & Whittle. (d) Henry Overton II, also at the White Horse without Newgate, listed 493 different views on pp. 23-36 of his 1754 catalogue. Typographically, it falls into two parts; a clearly laid-out text en pp. 23-29, and a closely set text on pp. 30-36. Apart from these publishers, known through their catalogues, I have seen the names of other publishers on views in the Rijksmuseum print room. These are John Tinney, John Boydell and F. Mayor. Other prints were jointly published: combinations of names that appear are Sayer & Ardell, Overton & Sayer, Sayer & Boydell, and Sayer & Boydell & Overton. Some perspective views remained popular for many decades; others did not sell as well, and were discontinued and the printing plates sold. In order to get an idea of the total number of existing perspective views and the continuity in popularity of certain groups of views, I made a table of concordance of the titles found in these six catalogues. From this table I compiled a 'flow chart' (fig. 45, above). In the flow chart, a closed box indicaties one catalogue cach. An arrow indicaties a description which is the same in the two catalogues, and the number on the arrow indicaties the number of identical titles. It should be noted that identical titles might mean that the plate was the same, or it might point to a different plate - whether a copy or completely unrelated. As can be seen in the chart, there is surprisingly little similarity between the titles of perspective views in these catalogues. Similarities exist in a few places only: the 1753 Sayer catalogue is almost entirely the same as the first part of the 1754 Overton catalogue. Wording, subdivisions and typography are very similar. The C. Bowles 1784 catalogue is quite different from the Overton 1754 catalogue, except for a few scattered views. Only two groups of prints, the 'Gardens al Stow' and 'Monamy's sea pieces', have identical tities. Greater similarity exists between the Laurie and Whittie 1795 catalogue and the combination Sayer 1753 / Overton II 1754. There are 100 views with identical titles, which means that more than half of Sayer's stock has been omitted. Similarities exist in the sections London, Scotland, Ireland, Holland, Paris, and Monamy's sea pieces. A view of the MANSION HOUSE apointed for the Residence of the Lord mayor of LONDON during the year of his Mayorality this noble Building was begun 1739 Contains in breath 100 in Depth 220 feet. Printed for & Sold by Rob Sayer at the Golden Buck opposite Fetter lane Fleet street. T. Bowles delin et sculp. This print first appears in Sayers's 1755 catalogue. 20 The second is a mirror-image copy after the first. Very close comparison shows that it is not a counterproof, hut amazingly copied to the smallest detail. Figure 47a shows the right-hand bottom corner of the Sayer print with next to it the almost identical part of the second print (fig. 48a). 21 The latter has been glued onto stiff card and punched with tiny holes, but it does not succeed as an iliumination view. The paper on the back is white, neither coloured nor transparant. The overall impression shows a somewhat lesser quality of engraving. The hatching in the building does not contributie to the perspective as successfully as in the first view. The text has been partially omitted and misunderstood by the engraver. lt is likely that the (French or ltalian?) engraver did not know English: 'Publiskdaccording to Aclof Paliament Aag 20 1751' (fig. 48). Another copy of the second print, of which figure 49 shows a detail, has successfully been turned into an illumination view, with various holes cut into the cardboard. The colouring is done in a sloppy way. 22 The third print (fig. 50) is a copy by Daumont from Paris, with a Latin and French caption, also a mirror image of the first. 23 The sky is a solid blue on top and pink towards the roofs. Only certain parts of the carriages are coloured red and yellow. The fundamental study on perspective views from Paris is the article by de Keyser published in 1962, from which most of the following information is derived.24 Perspective views made in Paris are in general of a lower quality than those made in London. The colouring is generally of a lesser quality than was customary in London, and applied with a brush, never through a stencil. Parisian publishers of perspective views were clustered in the Rue Saint Jacques, and the ateliers almost exclusively employed the technique of etching. The names of the publisher and the city they lived in were usually printed, but those of the engraver and designer seldom occur. De Keyser has supplied a list of those names that are given. He observes that they are not to be found in the standard reference works on the history of printmaking, and draws the evident inference that the artists must all have been on a humble artisanal level. In some cases it is clear that the publisher and the engraver are one and the same, for example with Chéreau and La Chaussée. According to Elsner von Gronow, 25the publishers issued the following numbers of different prints: 174 by Chéreau, 86 by Daumont, 160 by Mondhare, 77 by Huquier and 47 by Maillet. He does not state how many were issued by La Chaussée and Beauvais. The total production, which must have heen considerable in Paris, declined after 1790 and was much reduced by 1820. Only Basset kept publishing until 1840, but hawkers were still showing such prints in the early twentieth century.26 The beginnings of the genre are more difficult to trace, but de Keyser places it in the 1740s. The subjects of the prints, as in other countries, were predominantly topographical, showing towns and monuments from all over the world. The implication is that views from outside France were plagiarized from other prints; possibly many French views were as well. Other subjects that were popular were great events and public festivals. Religious or moral themes are rarely found in France (despite their great popularity in Augsburg). De Keyser remarks on the gross inaccuracy of many prints, and the fantasy that frequently inspired them, which brings them more into the realm of the popular print than the fine print. lt is, however, clear that even French 'vues doptique' never descended to the level Of the popular woodcut. The market for them was rather with the professional and middie classes, and they seem to have enjoyed a wide circulation around the country. The true popular print - almost invariably a woodcut - on the other hand was restricted in circulation and usually remained confined to the country or even locality in which it was produced. A good example of the fantasy employed by French publishers is given by the crude copy of a print or a painting by Claude Lorrain, which duly acknowledges him as the inventor, but yet boldly states that the scene shows the harbour at Rotterdam (figs. 51 and 52). Thanks to the large company run by the Remondini family, the ltalian town of Bassano grew into an important centre of printed images. 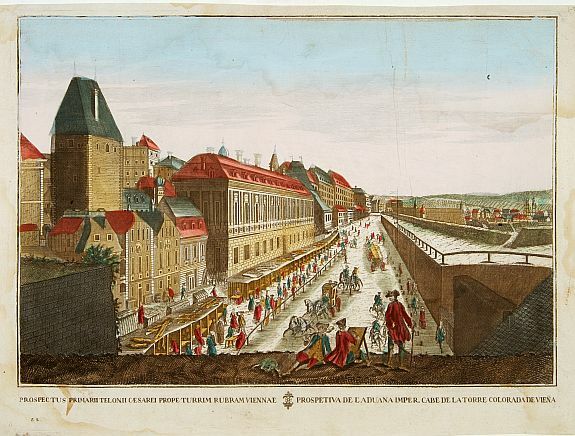 Perspective views were only one of the many kinds of prints made in their workshops. Giuseppe Remondini employed an extensive network of sales representatives in many European countries. 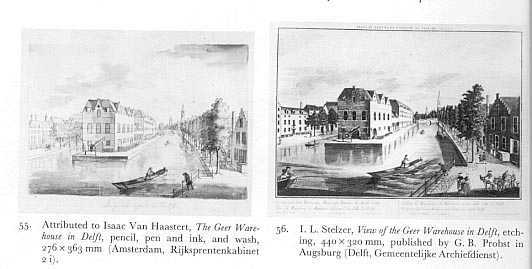 In order to compete successfully with the established European houses, he had numerous perspective views copied from existing Augsburg, Paris and London ones, and issued these himself, giving no indication of his own name and city, but instead copied intact the original captions and the original publisher's name. Such underhand practices led to a lawsuit in Augsburg and a stock of Remondini views was subsequentiy confiscated. This may well have taken place at the shop of Fietta who represented Remondini in Augsburg. This verdict did not restrain Remondini, who persisted in issuing copied views.27 A number of catalogues was issued between 1772 and 1817, in which different kinds of prints were advertised: religious prints, maps and popular prints, amongst which were perspective views. The number of different views was about 100 in 1772, about 200 in 1784 and almost 300 in 1817, of which 200 were views of ltalian towns. Remondini's views can be recognized by a code of numbers and three letters in the lower left-hand corner. There is also often a bilingual text. Other ltalian publishers issued small numbers of perspective views. Giuseppe Zocchi put out views of Florenee and Tuscany, and Marieschi views of Venice. Augsburg was another important centre of books and prints. 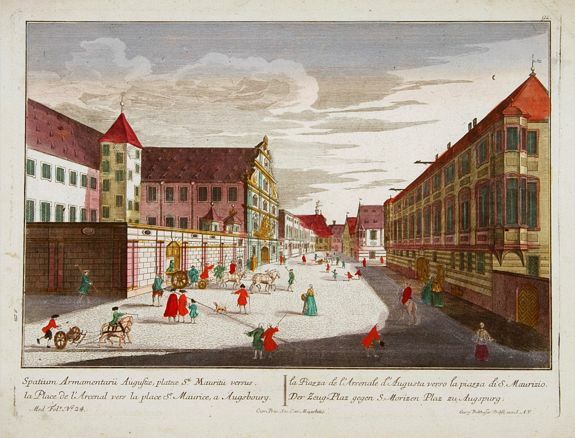 The Augsburg publishers succeeded in cornering an important part of the perspective view market from their London and Paris competitors around 1770. The period of considerable production lasted until c. 1790, after which the production in all centres declined.28 The Augsburg views were usually copied from existing prints, often from foreign perspective views, but errors were sometimes made in the captions, possibly out of ignorance or carelessness. Thus a view by G.B. Probst with the title View of the Kettel Gate in Delft, depicts another town entirely. The quality of the colouring in Augsburg ranges from mediocre to sloppy. Patches of strong colour are applied by a pad or brush, red for the roofs and clothing, green in the trees, and brown in the water. The number of colours is limited to four or five. There are no changing hues of colour, nor are the outlines of the objects coloured in carefully, as in the London views. This bold way of colouring was customary in catchpenny prints. Se vend a Augsbourg au Negoce Commun de l'Académie Imperiale d'Empire des Arts liberaux avec Privilege de Sa Majesté Impériale et avec Défense de n'en faire copie. Josef Carmine (1770- c.1830) both etched and published about 150 different views with captions in three languages. Other Augsburg publishers started a lawsuit against this 'miserable charlatan' who produced mediocre work and also spied on other publishers. Dominikus Fietta (active 1788-1807) both etched and published about 40 different views with captions in three languages. He was one of Remondini's many agents. The muitilingual captions of the Augsburg publishers promoted the international sale probably more successfully than those from Paris, London or Bassano. Whereas they usually give the name of the publisher, it is unusual to find the name of the designer or engraver. A number of exampies are known of draughtsmen who had a long-term relationship with Augsburg publishers. The first is the German F. B. Werner (1690-1776) who travelled throughout Europe between 1727 and 1736 and drew profiles of towns and buildings for Augsburg publishers. The fact that he worked for several publisbers at the same time cut down the cost.29 According to Ms. Angelika Marsch, who studied Werner extensively, he made sketches during the daytime, and reworked these into drawings the size of the final print. He did this either at night, at the inn he stayed in, or in his workshop during the winter, when he was not travelling. 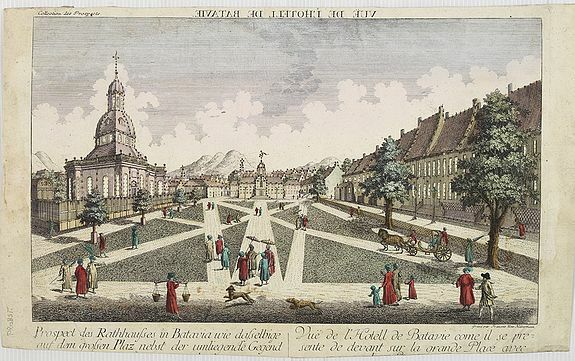 A second draughtsman mentioned on views issued by Probst is Isaac van Haastert (1753-1834) from Delft. Three drawings in the Rijksmuseum print room, for which the artist and the purpose were not previousiy known, can be recognized as preparatory drawings for perspective views. The first drawing (fig. 54) shows the South End of Delft, on the right the Rotterdam gate and in the middle the Schiedam gate.30 The second drawing (fig. 55) shows the weapon warehouse 'magazijn de Geer' on the Geer canal (this building is also visible on the first drawing, to the left of the bridge). The third drawing, not reproduced here, shows the 'Hague gate' on the road to The Hague. These three drawings clearly constitute a series. Each sheet, roughly the same size (300 x 400 mm), has been folded in the same manner, and bears the same watermark. The titles form a characteristic feature, because they are repeated at the bottom centre and at the top centre, worded slightly differently. On the bottom right- hand side are the monograms Jchi and Achi, whose meaning has not yet been determined. A perspective view publisbed by Probst (fig. 56) is clearly based on the second drawing. The lettering on the print identifies the draughtsman as Isaac van Haastert, a local Delft artist. According to the documents of the St Luke's Guild he was one of the few professional artists at the time, and was chief (hooftman) of the Guild for a period around 1790. The manuals state that he painted, etched and engraved townscapes and village views, and later landscapes as well. His work can be seen in the municipal archive and in the municipal museum 'Het Prinsenhof' in Delft. The drawings were clearly not meant as finished works of art. In the first (fig. 54) the artist has redrawn the horses, and the skies have been left blank. They give a sterile, traced impression. Van Haastert did indeed trace over his black crayon outlines with pen and ink, but even these crayon lines have little of the character of a sketch. The architecture has been executed schematically, without hesitation or shakiness of line. All three drawings have been given a somewhat exaggerated perspective by stressing the orthogonals. 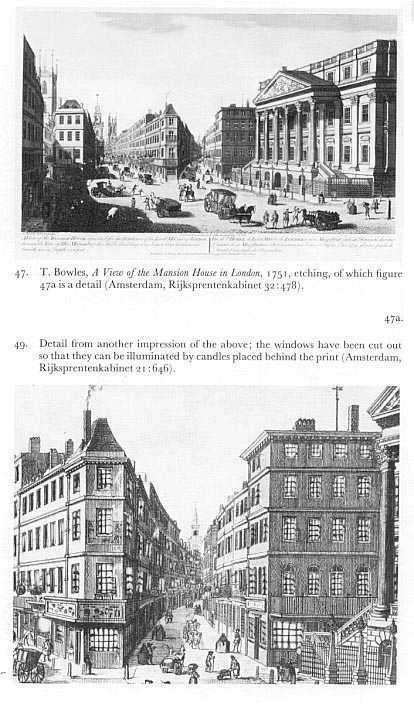 Because the first drawing shows buildings frontally, Van Haastert had to perform some tricks. By choosing a wide angle, and adding perspective elements to the quay, ships and position of the masts, he succeeded in obtaining an illusion of depth. lt is notable that similar distortions were also added by the engraver. Comparison of figures 55 and 56 shows how he emphasized elements at both sides of the composition so as to stress the perspective; furthermore, so as to simplify the appearance of the building, Van Haastert left out one entire floor of the warehouse. The connection between Van Haastert and Probst was of some significance. Many other views of Delft and other nearby towns such as The Hague and Schiedam published by Probst bear his name as draughtsman. They also collaborated in a series of smaller sized topographical prints of a more artistic nature. In this series the buildings' outlines are less important and textures have been depicted. Outside Augsburg, in The Hague, an isolated series of perspective views was produced by Hendrik Scheurleer (1734-1768). He etched and issued a series of 30 views of The Hague and nearby towns in the regular size of a perspective view. His technique is topographically reliable hut artistically somewhat awkward. One of Scheurleer's copper plates, a view of the royal House in the Woods in The Hague, found its way to the publisher Robert Sayer in London. Sayer then erased Scheurleer's name and replaced it with his own, as was the normal procedure at the time. Impressions of both versions can be found in the Rijksmuseum print room. The decline in popularity of the perspective view between 1790 and 1850 is difficult to explain, but stereoscopic photographs, which appeared on the market after circa 1850 entirely superseded perspective views because of their superior illusion of depth. As this text was electronically scanned in 2001 from the printed edition, minor errors may occur. Please see the printed copy when professionally referring to this article. This published article is an elaborated version of one published in Dutch (De Boekenwereld, 1, nos. 2 and 3, 1985). I should like to thank all those colleagues, in Germany, France, ltaly, Holland and England, who have offered invaluable assistance, in particular the following: Drs. F. J. Heijbroek of the Rijksmuseum and editor of De Boekenwereld who generously edited my original draught, Mr. M. D. Haga, also of the Rijksmuseum, who suggested I write about the Van Haastert drawings; Marie van Dijk of the Meertens-Institute who kindly allowed me to read her research notes; Antony Griffiths of the British Museum and Anne Lyles for their enthusiastic help; and also Angelika Marsch, Wolfgang Seitz, Véronique Léry - and finally Brenda Kaldenbach who edited the text and helped with the artwork. The only collection which I have systematically examined is that in the Rijksmuseum. 1. The most important literature on perspective views is the following: F. Pouy, Les anciennes vues d'optique Amiens 1883; H. Elsner von Gronow, 'Guckkasten und Guckkastenbilder', Orpho XXIII, 1932, pp. 1-53; E. de Keyser, 'Un domaine méconnu de I'Imagerie: Les Vues d'Optique', Bulletin de la Societé' Le vieux Papier', XXIII, fáscicule 198, 1962, pp. 137- 68. V. Léry, 'Les Vues d'Optique', 100 Vues d'optique et curiosités, exhibition catalogue, Pontoise Museum 1977, and W. Seitz, 'Augsburger Vedutenstecher der 18. jhdt. Daten und Werke' (typescript), Augsburg 1982. Literature on the viewing machines is described below. 2. This term is that most commonly used in English; the machine was also often known as 'zograscope'. The term used in Dutch is optica, which is derived from the French optique. In Germany the machine is a Guckkasten and in ltaly it is the Camera Ottica. See also p. 90. 3. De Keyser (op. cit., pp. 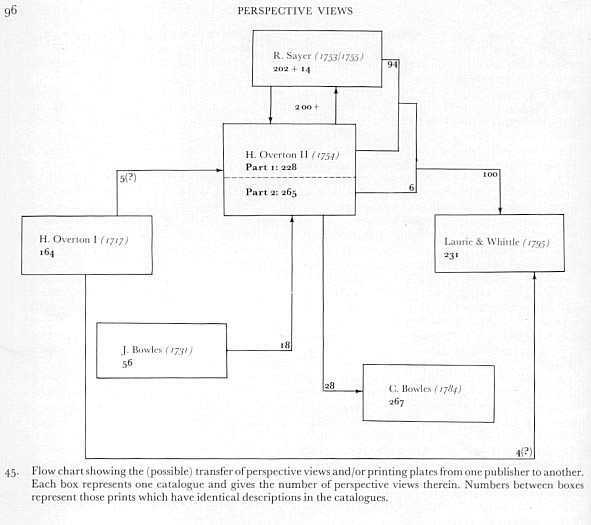 143-44) claimed that no perspective Views were published before 1725, dismissing as copies (after existing prints) those views which A. Dubois had argued ('Les Vues d'Optique', Bulletin de la Societé 'Le vieux papier' XXII 1958/60) could be dated to the same year as the events they depicted (variously 1677, 1678 and 1687). Keyser also claimed (idem, p. 146) that Perspective views only began to decline in popularity as late as 1820. 4. J . Bischoff, Beyträge zur Optik, Ulm, Frankfurt, Leipzig 1764, quoted by Elsner von Gronow, op. cit, p. 14. Balzer, Richard (1998) Peepshows: A Visual History Harry N Abrams, New York. The text is quite short, the bulk of the book being given over to 180 antique print illustrations showing peepshows in use. Chaldecott, J A (1953) The Zograscope or Optical Diagonal Machine Annals of Science, Vol 9 No 4, London (article). Chaldecott is noted as an Assistant Keeper, The Science Museum, London. Clayton, T (1997) The English Print 1688-1802 Paul Mellon Centre / Yale University Press, New Haven and London. See pages 140 and 141 of this major and comprehensive work. Clayton also illustrates several perspective prints. Kaldenbach, Kees (1985) Perspective Views Print Quarterly, June 1985, London (article). Sayer and Bennett (1775 edition) Catalogue of Prints Holland Press, facsimile reprint 1970, London. (The small text reproduction is taken from this reprint). Stanley, Ted (1997) The Polyrama Panoptique and Other Optical Views: Conserving a Fusion of Science and Art IPC Conference Papers, 1997, London (article). An interesting general review of optical instruments, before focussing on the paper conservation issues.